The OxiMax MV Series Cells consist of concentric seamless Titanium tubes, coated with our long life SC12 MMO coating. Internal PTFE spacers locate the tubes so that the seawater flows through the annulus at high velocity, giving both self cleaning and high efficiency. The OxiMax MV Series is perfectly suited to offshore facilities using seawater for their treatment water needs. Disinfecting the seawater with OxiMax MV Series can prevent biofouling and ensure continuous uptime and availability of this critical system. The OxiMax MV Series can also be used for disinfection of seawater used/stored in the sea chests, the condensers and the seawater injection systems. The OxiMax MV Series is great for offshore applications as they do not require acid cleaning of the electrodes. 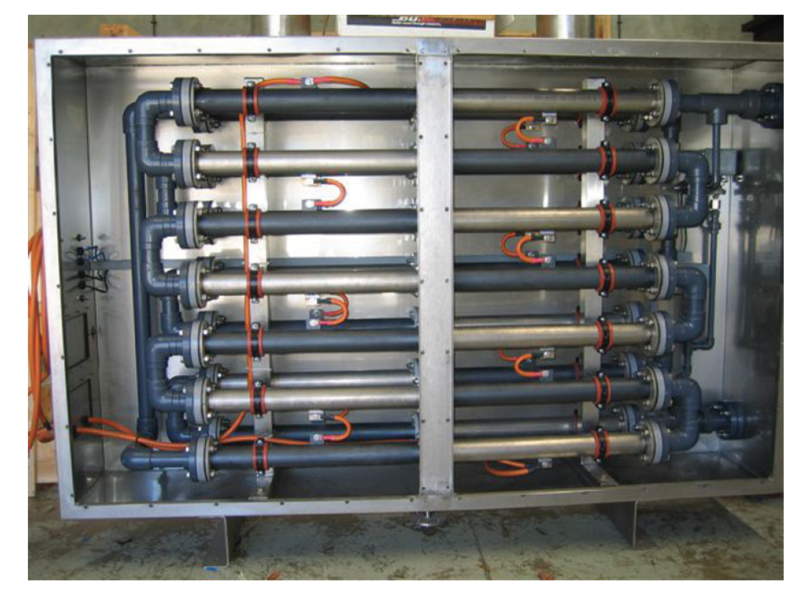 Seawater from a pressurised line is passed to the skid mounted OxiMax MV Series and forced through the concentric tubular cells at a high velocity. DC power is applied to the seawater inside the cells which results in the production of Sodium Hypochlorite (NaOCl). If you require 120kg/hr of Cl2 cells equivalent, we would offer an MCC120000 = 12 x MCC (10 kg/hr) cells or an MCC120000/8 = 8 x MCC (15 kg/hr) cells. OxiMax MV Series Cells use flanged connections rather than compression fittings, to allow higher pressure operation, along with greater reliability and service life. We have fully qualified electrical and chemical engineers working on each project. Our team have given great customer satisfaction over numerous successful projects. All our systems are designed in-house by our expert chemical engineer. 18 Manufacturer Drive, Molendinar QLD. Water Engineers and its associate company Anode Technology have been designing and manufacturing Electrochlorination equipment and coated titanium anodes for more than 25 years. We hold a number of patents and our water treatment equipment is well recognised throughout the world. Send us your email so we can shoot you a brochure specification list.